In Hässleholm there are several popular destinations and activities that you should not miss during your visit. Here is something for all tastes and interests. Below you can find suggestions for some of the treasures and gems. With its 500 years of history, Hovdala Castle is the pride of the region and a popular tourist attraction. The castle was inhabited for several centuries by the Ehrenborg family. Today, the castle is a national cultural heritage and offers visitors a vista of grandiose simplicity, quiet and serenity. During the summer, we recommend a guided tour of the Ehrenborg apartments. The summer programme includes gardening activities, interesting exhibitions and beautiful music, among other treats. A number of popular family events are held every year, such as the medieval fair with the great tournament, Glöttadán (with lots of activities for children) and the harvest festival. The gardens and park are open all year round. The store, restaurant and café are open only during the season. In Hässleholm area there are many opportunities to experience nature and outdoor life, recreation and sports. Here are a number of picturesque and accessible options with clearly marked trails and footpaths meandering through the changing landscape. For thousands of years, this borderland was shaped by the inland ice and mighty earthquakes to create the natural conditions for the incredibly varied and exciting geography of northern Skåne. You are offered heights with beauteous vistas as well as deep valleys, ravines with roaring waterfalls, winding streams and tranquil pools, majestic beech forests, sprawling pastures and enchanting spruce forests. The forests has an abundant animal and bird life, and many rare plants. You may encounter elk, roe deer and deer during your wanderings. The area has one of the greatest varieties of bats in Sweden, and the Åraslöv Nature Reserve has a great number of orchid species. Choose between magic discoveries at Hovdala Hiking Centre , bewitching forests and hilly landscape in Vedema , the nature reserve in Ubbalt which is rich in mosses and lichens , the Vieåleden trail close to Skeingeborg and the wetlands of Hörlinge meadows, the Lursjöleden trail close to the cleanest lake of Skåne, cultural trails in Möllerödssjön lake and recreation area or the orchid-rich grounds at Åraslöv . Furthermore do two of Skåneleden’s trails pass through Hässleholm municipality - Coast to Coast and North to South. Take the train to Hässleholm and start your trek across the Hovdalaleden/Skåneleden right by the station in the middle of town. There are marked trails from both sides of the train station. The other hiking areas throughout the municipality are easily reached from Hässleholm by bus or train. Enjoy the wonderful vista from the treetops when gazing out over the Finjasjön lake and Hovdala Hiking Centre. The Hovdala Treehouse is the largest treehouse in Scandinavia. It is situated on the beech slopes only 2 km from Hovdala Castle. In the summer, the Treehouse acts as a café, and during the rest of the year it is a unique venue for conferences and meetings. During Sundays in April to October, you can enjoy a picnic in the Treehouse, as the Friends of the Treehouse keep the house open, frequently accompanied by an exhibition or other activity. Descend into the depths of the earth and discover the magical world of the Tykarp´s cave (Tykarpsgrottan) in Ignaberga, Vinslöv, about 7 km from Hässleholm. With its stunning pillared halls and winding labyrinths, the cave is as something out of a fairy tale. In recent times, the cave has been used for the shooting of a number of films, such as Ronja the Robber’s Daughter. Take a guided tour 12 metres below ground – an exciting experience for old and young alike. Reserve a theme tour of the hibernating bats or go fossil hunting as part of an exciting underground excavation. Take a break at the café serving delicious cake, ice cream and hearty sandwiches. The gift shop offers a number of interesting wares related to the cave and the bats. In December an annual Christmas market is held where you can purchase unique Christmas presents and top up the Christmas larder. In the cave, the children can crawl down the Santa Tunnel and leave their wish lists with Father Christmas himself. If you are lucky, you might run into Tufsa the Troll who rules the cave. Above earth is a children’s funfair, pony riding and other attractions. The first fully accessible zipline course in Europe is found in Sandåkra, approx. 10 km south of Hässleholm. Everyone, regardless of physical disability, can here enjoy excitement and adventure. You´ll find both the ropeway, tree climbing and the zipline. With a drop height of 26 metres, you can achieve speeds of 50-60 km/h. A perfect activity offering mobility, exercise and joy. One of the largest model railways in Sweden is found in Hässleholm, and shows what the town and its surrounding stations looked like during the 1960s. The model is in 1:87 scale and has thirty-something trains and double-track digital operation. It uses a total of over 1,500 m of track and over 350 switches. The building models and environments were constructed based on original drawings and old photographs. Viewings are held twice monthly, and a train market is held every year in October for model railway enthusiasts. At the farm Alpakahof in Hultet, Västra Torup, west of Hässleholm, the whole family is invited to experience the farm and its different farm animals. During a farm tour you will learn more about all the animals on the farm, pet them and cuddle with them. In the moose park you will visit the moose and their calves while walking on cosy forest trails. Maybe you will have an opportunity to give them some apples during your visit? You can also book an alpaca trekking for a different nature experience in the Göinge forests. Let yourself be enchanted by the alpaca´s calm and escape all the demands of the normal life. Children that normally do not enjoy walking, seem to forget time when walking with an alpaca. In the farm shop there are products of alpaca wool, moose souvenirs, ice cream and much more. You can get inspiration from other visitors as well regarding what you can do and which places to visit during your stay in Hässleholm. Click here and read more about the information on Tripadvisor. In Hässleholm there are many attractive and unique activities every year that attracts visitors from the whole country and from abroad. Visit us you too! The northeastern part of Skåne is a unique part of Sweden. A borderland between true wilderness and city life, where the great outdoors is spiced with culture and history. You’re never far from nature here and you will find everything in between hilly landscape and white beaches for miles, or deep mossy forests with inviting lakes to swim in. The comfortable and varied nature offers both calm, peace and quiet as well as exciting and challenging activities. Outdoor and nature activities attract visitors all year round and give you opportunities to many experiences. Here are exciting and beautiful recreation areas for hiking, you can bicycle along the Southeast trail, paddle and fishing in rivers and lakes, climb in adventure tracks, try out bouldering in a fantastic stone landscape and much more. Hike on tough routes for experienced hikers or take leisurely strolls through rolling plains and deep forests. 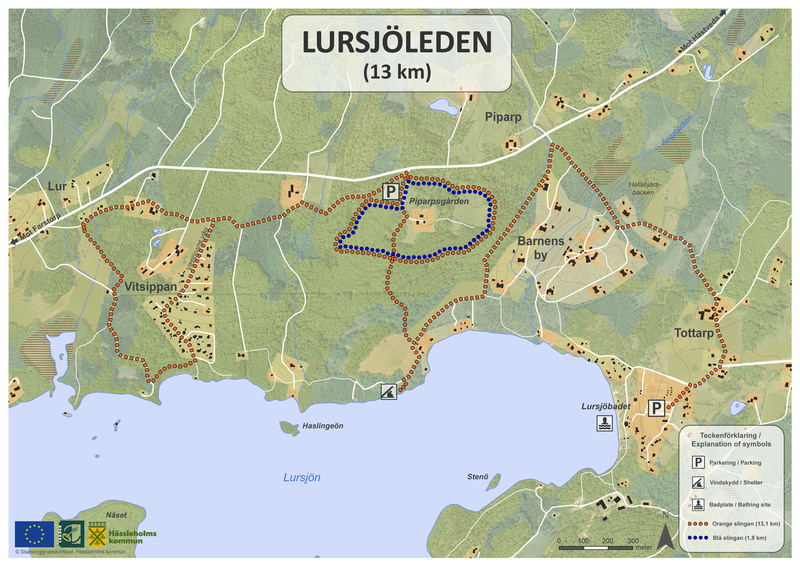 Cycle on Sydostleden (Southeast trail), take the small, winding country roads, or take a horse riding tour. Try bouldering on the amazing rock landscapes from the time of the great inland ice age. Fish and canoe in the local rivers, wade through the wetlands with its unique flora and fauna, dive in the sea or walk the miles-long sandy beaches. There’s something to love here all year round. Castles and forts bear witness to the area’s dramatic history, when Snapphanarna (musket men) fought during the time of the Danish king. Here’s a rich cultural program with art from internationally renowned artists and lots to do for our youngest family members. Discover the good life among charming farm hotels, restaurants and farm shops with locally produced food. More information about our destination, and tips about things to see and do, can you get in our Visitor´s map. Please make an order here or download the map as a PDF file. The municipalities in Northeastern part of Skåne - Bromölla , Hässleholm, Kristianstad , Osby and Östra Göinge - welcome you to many unique experiences!